A routine inspection of the GWK Abattoir and feedlot in De Aar in the Northern Cape by NSPCA Senior Inspector Grace Le Lange, uncovered yet more cruelty and farm animal welfare issues. 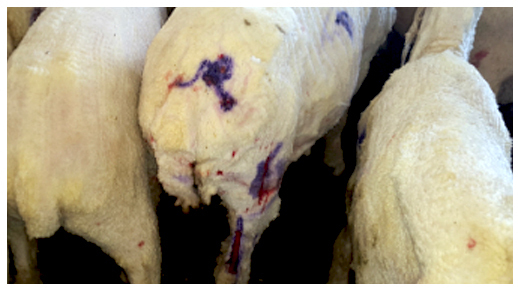 This time the ill-treatment of lambs and sheep through extremely rough handling and bodily injuries caused by inept shearing. Intervention by de Lange brought the process to a halt. One animal had up to 14 cuts on it. There are only two NSPCA societies for the entire Northern Cape area, one inspector is based in Upington and another in Kimberley. Due to these staffing constraints, NSPCA have to make special trips to these areas. One sheep had up to 14 cuts. Accepted industry standards were contravened. See more on the NSPCA here. Thanks for your query. As per your telephonic discussion with Alex, we have engaged with GWK Abattoir, the NSPCA and the shearing company, BKB. · GWK, have trained and appointed feedlot staff to provide on-going oversight and evaluation of shearing teams stationed at their sites. The have also developed control sheets that will be used to evaluate shearers and animals as and when shearing is performed. To ensure that these controls are adhered to, GWK’s Feedlot and Facilities Managers have developed an inspection schedule that involves periodic site visits, after which any incidences of non-conformance will communicated to the BKB management team immediately. We are encouraged by the steps that have been taken to address the issues raised, however, we remain open to further input from the NSPCA and interested parties on this matter. Thanks for sharing this Donovan and super that you received a response from Massmart, we did not but then again we also asked Massmart where their policy was on animal welfare – since it is no where to be seen. Perhaps you could prompt them for an answer on this. It certainly encourages us to see that consumers are adding their own voices to these concerns in South Africa – well done indeed! Well done Grass, for exposing yet another travesty! The best we can do is to keep speaking out. I wonder how Woolworths et al are going to justify this? I personally cannot spend my money at cruel corporate institutions that care nothing for kindness and humane practices. Find your own supplier and support small farmers. Grow your own vegetables … adopt chickens and boycott chains! !